Everyone has a personal brand and it often plays a critical role in professional success, advancement and business development. 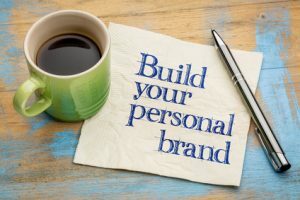 Similar to a business’ brand, your brand is a promise of what others will receive from you, what you will be known for and how people react to your personality and approach. Whether or not you actively cultivate your own brand, others will form impressions of you based on what they know, see, hear or experience about or with you. It is imperative, therefore, that you define or perhaps redefine your brand to make sure others experience the person you want them to know, like, respect, trust and hire! Provide a credible, distinctive and trustworthy identity. Attract people to you and your expertise. Distinguish you to separate you from the pack in a crowded market. Portray the kind of qualities you want people to perceive in you, e.g., confident, go-getter, a visionary, a team-player, a connector/power player, someone who gets results and gets things done, etc. Develop a positive “buzz” about you. The first step in this process is to first understand the brand you already have and decide if it is the brand you want to have. Remember that with so much that is accessible online, people may already know a lot about you. Take time to Google yourself and see what comes up. Look carefully at what others can find out through Facebook, LinkedIn and other social media sites including those you consider to be personal. What qualities make me distinct from my competitors? My colleagues? What do I do that adds remarkable, measurable, distinguished, distinctive value? What have I done that I can unabashedly brag about and shamelessly take credit for? What do I want to be known/famous for? What is most important or personally meaningful to me? An exceptional expert at something that is relevant and has value to others. A visionary and strategist, able to think forward and broadly. A team-player and supportive colleague. A business adviser focused on pragmatic solutions and benefits. Be the responsive and trusted advisor your clients and others seek. Increase and showcase your skills by speaking on panels at conferences where clients, referral sources and other “influentials” will be. Write practical, user-friendly articles with tips and insights on issues of most interest to clients. Be responsive to internal requests and demonstrate an eagerness to help others with their projects and needs. Volunteer for an internal task force or important project. Look for and get involved in an important external leadership role or activity. Nurture your network consciously so others know and trust your brand and can promote it. Get and use your influential and reputational power: get a seat at the table, become first chair and lead cases and teams, make a significant contribution as a thought-leader. Be loyal to your clients, colleagues and team. Monitor your brand online. Regularly Google yourself and your firm. Review and if necessary revise your bio, your LinkedIn profile and any other social media presence you have or use. Your bio and LI profile should be updated at least quarterly to reflect new accomplishments and matter. Use LinkedIn, Facebook and Twitter to link and comment on thought-leader topics and articles in your niche. Develop a compelling story about you and a succinct and interesting self-introduction or elevator speech. Work on your presence and physical appearance. Do they convey confidence, competence and trustworthiness? Things like your handshake, your directness, your dress, your posture, your tone of voice all impact impressions people have of you. Do some self-assessment and develop your emotional intelligence. There are a number of easy to take personality and communications style assessments, e.g., DiSC, MBTI, StrengthFinder, etc. Discover your strengths and style and learn how to engage others more effectively.